My TA said that WDW has been recently releasing dessert party times about ~60 days in advance. So, I still have some time on that. My autograph book is in my bag today, so I can take an inventory during lunch. Have I mentioned the sounds of the University buses when they drive by me on my walk fill me with joy because they remind me of Disney transportation? It's possible I'm totally in love with Disney. Still no dates available for the Star Wars Dessert party. What gives? I'm thinking of emailing my TA today to see if he knows the situation. 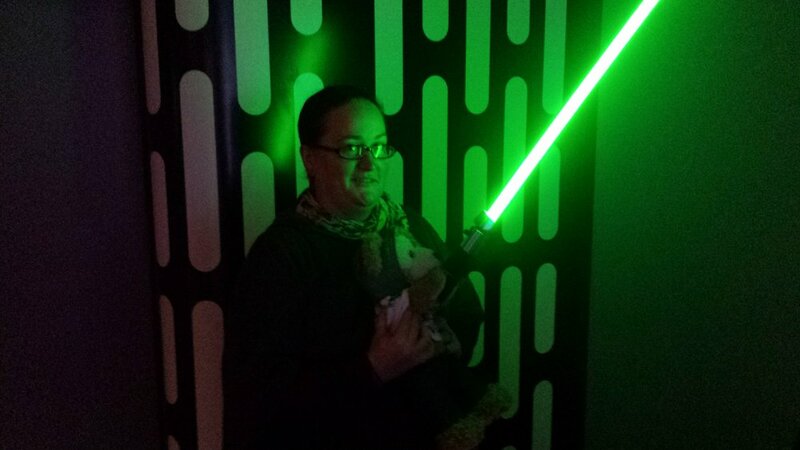 Duffy holds a light saber. I'm starting a list of our must-dos. We have plenty of time to hit the stuff we love (Haunted Mansion, Jungle Cruise, Pirates, Spaceship Earth, etc...), so I'm focusing on some things we haven't experienced yet....which are more in the "diversion" category, but that's fine. Wow! Only 11 day until Dalmatian Day! Dalmatian Day is considered a countdown milestone in the Disney planning community. Instead of marking 100 days, we mark 101 in honor of the movie 101 Dalmatians, of course! I'm feeling rather excited for Disney this morning....I think it's because it's the beginning of October, the double digit countdown is in sight, and it's less than 4 months to my trip. October, November and December are my favorite months...so the wait is even more tolerable now. We are going during our normal time in January- nice weather, low crowds, value season, no holidays....just the way I like it! Last year, we stayed at All Star Sports. I liked it, and would happily stay there again. My husband, however, wanted to try something the next step up (small step....still a value, but a better quality value). Hence, Pop! Lots of people LOVE Pop and consider it their "home" resort. 3 of these 8 are repeats. 3 are brand new to us. 1 is a chain we've been too before in other locations. 1 is a place we've gone to but for a different kind of meal. We like to do a mix of new and repeats. Breakfast at Garden Grille! Dessert = early access to The Land Pavilion. No wait for Soarin'! I made a free decal! 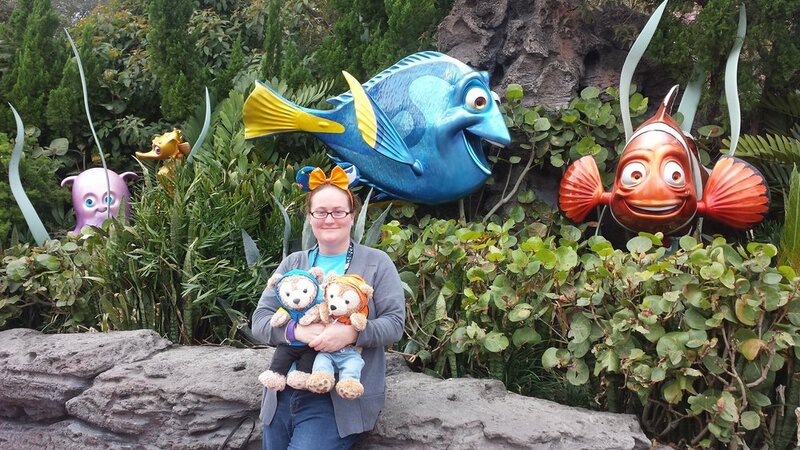 Please note, I am wearing a pin lanyard and carrying Duffy. Our cat Dixee is also on the decal because she's going to Disney with us! I found this freebie on http://www.chipandco.com/ but, unfortunately, I can no longer find the exact post. If you do find it, please leave it in the comments! Only 189 days left: Time to start getting serious about planning! Walt Disney World is an ideal trip for those who like to plan ahead, make schedules, and dream about their trip well in advance. Your WDW experience will definitely be better if you do at least some planning (unless you are someone who goes very often). I have 189 days left in my trip, which means in 180 days I will need to make my Advanced Dining Reservations (ADRs). Since I'm going in value season with low crowds, making reservations this far out isn't necessary if you don't care about when and where you eat. However, I have a couple of places in mind that will fill up pretty quick and we like to eat during the typical dinner ours. Therefore, I plan to make most of my ADR's around the 180 mark. Did you know that official/certified WDW agents are free? Further, they might help you save money. WDW already wraps up the cost of the agents into their pricing, so if you purchase from Disney directly, you are paying for an agent without using one. If you have plenty of time, like to research and pre-plan, and don't mind making phone calls early in the morning....you don't need an agent. However, it wouldn't hurt you to have one in case you need trouble shooting. I love planning and I intend to make all of my ADRs and Fastpass reservations online. Still, I got an agent. My main reasons were time and phone calls. I arranged my trip via email with my travel agent, which was way easier than dealing with Disney's site or phone system. Further, I want the best possible discount when they are released for winter packages. My agent will be up before dawn calling Disney to make sure I get the discount applied to my package, and will do the math to figure out the best possible discount for me. Also, if I fail to get an ADR that I wanted, or if I have an issue with the Disney system, or want to book a tour (I do!). My agent can handle all that. Less phone calls and stress for me! To find an agent, I went to what I consider my most trusted Disney resource on the web.....touringplans.com! They write the "Unofficial Guide" which has to be in the top two most popular Disney guides. They have been collecting LOTS of data for years. And as a scientist, I love going by the data! I'm getting ready to go to Walt Disney World in late January and I'm looking around for a travel agent. I'd like to be up front and say that I am e-mailing multiple agents in an effort to find one that matches my needs.Thank you in advance for reading my long e-mail, I know your time is valuable. My party consists of two adults and no kids. However, you should think of us more like an adult plus a kid. I love childish things and I can easily ride It's a Small World five times in a single trip, and I have no desire to spend anytime on the Boardwalk or Disney Springs. I trade pins, collect tsums and will wait in line to hug a character. I go to Disney to be a kid again. My husband is fascinated by the customer service, quality and magic of Disney, and loves seeing me so stress-free. We are planning on staying at a value resort, but we'll be there for awhile (8 days?). 1) Do you mind if your clients handle their own fastpasses, touring plans, etc...? 2) Do you wake up super early for clients, or check repeatedly when needed, to get discounts or good Fastpasses/reservations? 3) Do you think we'd be a good match? Sorry for the third-degree grilling, and thank you so much for your patience reading this. I appreciate your time, and the hard work you do. One of the things that mattered most to me was their response time to the email. I want a TA that will respond quickly. I appreciate that they all have lives, but I need someone who will be there promptly when there is a problem. Other than that, I looked to see how well they read my email....if they were just spewing the standard bits, or if they actually addressed what I wrote personally. As well as how they answered the question. I crossed out people on my list when I wasn't liking the vibe, and added stars next to their name when they responded in a way I approved. It came down to two Amanda from Small World Vacations, and Mike from Magic for Less. The thing that tipped it was the fact Mike hosts a podcast that I've listened to on many occasions, and I like this personality on the podcast. His enthusiasm really shines through. That ultimately tipped the scales in his favor. Mike has been great! Friendly, fast, efficient and thorough! I'm very pleased with my decision! Only 37 weeks (roughly) until our 2018 WDW trip (which I'm calling Zipadeedoodah)! And I really need to get planning. I have done very little planning so far. All I know is where we plan to stay and that we are going sometime in late January. My core resource for all my Disney vacation planning is touringplans.com. I use the WDW Park Hopper policy of never waiting more than 20 minutes for a ride, and there is no way I'd be able to achieve this without the Touring Plans website. Also, figure out my hotel, but that's already done! We are staying at Pop Century. While I was very satisfied with our stay at All Star Sports, and would gladly do another All Star, Jimmy wants a tiny bit of an upgrade. So we are going to give Pop a chance. More updates on planning coming soon! It's time to start planning our next trip to Disney. I haven't picked out the exact dates yet, but only there is only about 39 more Mondays to go! Time to start researching, list making and studying crowd calendars again! Yippee! Our fifth day in the parks was our second and final day at Epcot. Fortunately, the crowds were on the low side of moderate (our previous visit was the high side of moderate) which helped us have a better day. The morning of this day was definitely one of my favorite mornings. We had a wonderful breakfast at Garden Grille and then walked on to Soarin' with no wait. We then had our own boat for Livin' with the Land. It was truly a magical morning! The Garden Grill- I was a little nervous about this choice. We aren't breakfast people. On all the other days, we ate poptarts, fruit, granola-type things, etc... In addition, Garden Grill was family-style. We don't eat a lot in one sitting, so all-you-can-eat type affairs aren't something we enjoy. And lastly, we've avoided character meals due to price, crowds, anxieties, etc... So, why did I pick it? Well, I got a pre-rope drop reservation which was supposed to allow us to go on Soarin' with no lines! It was highly recommended by WDW Prep as a good touring strategy, and I decided to give it a try. It turned out to possibly be my favorite meal. The food was delicious. Neither of us ate the bacon because it was way undercooked, but this didn't matter to me because I actually loved their cinnamon bun. I don't like cinnamon buns/rolls at ALL. This thing was delicious. All of it was delicious. Delicious waffles, scrumptious tater tots, yummy sausage, POG juice, and more. Service was great. We got a great booth with a nice view of Living with the Land. We saw all the characters. It was a wonderful experience, and it worked like a charm! NO lines for Soarin' and we got to ride Living with the Land by ourselves! Not only will I do a pre-rope drop ADR at Garden Grill again, I plan on doing it next year! Lotus Blossom Cafe- This wasn't part of the plan, but Jimmy was starting to fade so I wanted to stop somewhere and have him sit down for a bit. We shared Orange Chicken and Potstickers. It was average- worse than last time we are there. They also had a special Festival of the Arts food. It was cute, but bland, and way overpriced. Tangerine Cafe- For dinner, we at the quick service place in Morocco. We shared the Chicken Schawarma platter. It was pretty good. I liked the quiet atmosphere. We did the "Pick-a-Pearl" in Japan...there was no wait! I got a single golden pearl. I also met Baymax. I had a beautiful Festival of the Arts dessert that turned my tongue blue! While Jimmy relaxed in the hotel room that evening, I went down to the gift shop to pick up a bag we had sent to the hotel a couple days prior, and I took a quick snapshot of our lobby. Many folks are asking me for all the details of our latest Disney trip, so here they are for you, in blog form. I'm going to take one day at a time and cover all the highlights. For those of you who haven't been to Disney, it would take all day to tell you all the details about the trip. Walt Disney World is amazingly huge, and we are very active on our trips! Our first day was in the Magic Kingdom...the park that everyone thinks of when you say "Disney World". It has the most rides and, of course, the infamous castle. Over the last couple of trips, Magic Kingdom has elevated itself to my favorite park. The environment is so happy and energetic. I will always be a child at heart, so it suits my silly personality. ShellieMay was in her Sleeping Beauty outfit, while Duffy had a treasure map on his t-shirt! Jungle Navigation Co. Ltd. Skipper Canteen- The Skipper's Canteen is a restaurant modeled after one of the classic Walt Disney Attractions (and one of my favorites! ), The Jungle Cruise. It is travel and adventure themed with decor and a menu based on tropical destinations in Asia, South America and Africa. The ride has a cast member (a skipper) who takes you on a guided tour. The restaurant is filled with the same pun-filled "dad"-style jokes that are on the ride , and that I adore. The menu and servers at the restaurant have that exact same sense of humor. (Egyptian-inspired dish of Spiced Braised Beef, Pasta, Cheese, and Béchamel Sauce served with Seasonal Vegetables). For dessert we had the Kungaloosh! (An African-inspired Chocolate Cake with Caramelized Bananas served with Cashew-Caramel Ice Cream topped with Coffee Dust). Everything was delicious, the ambiance was fun, and our server was great. This was definitely one of my favorite meals. We had planned on eating at Columbia Harbor House, but they closed at 5pm on that day (for some strange reason). We ended up wandering in to Tortuga Tavern, hungry and tired, and afraid other things would close soon too. We ended up having hot dogs, as their menu was limited. The environment was great (quiet, outdoors, plenty of seating, themed like Adventure Land), but the hot dog was average theme park food. This was counter service, so we didn't have a server. It'd be too long to explain each of the here, but if you are curious about any of these attractions, please let me know. I love talking about Disney. I also know a great website for ride videos if you want to see what any of them are. Disney attractions are unique- so much more than roller coasters and motion simulators. The detail that goes into the theme of each attraction is simply amazing. A Pirate's Adventure- Treasures of the Seven Seas- This was a four part quest around Adventureland. It was a bit like geocaching...we got clues, had to find the right spot, and then got some loot in exchange. I will write more about it in a later post, but I highly recommend it! Great Moments in History with the Muppets- A short little outdoor show that retells pieces of American history in the style of the Muppets. Adorable and not too crowded. It was a nice filler while waiting for our next activity. We left the park earlier than planned, but accomplished everything we wanted thanks to our customized touring plan (touringplans.com). We had no character greetings on Day 1 since there aren't too many in this area of the park. We gave a shout out to Skipper Patrick when we took an in-park survey about our experience in Adventureland. I didn't trade any pins on this day. 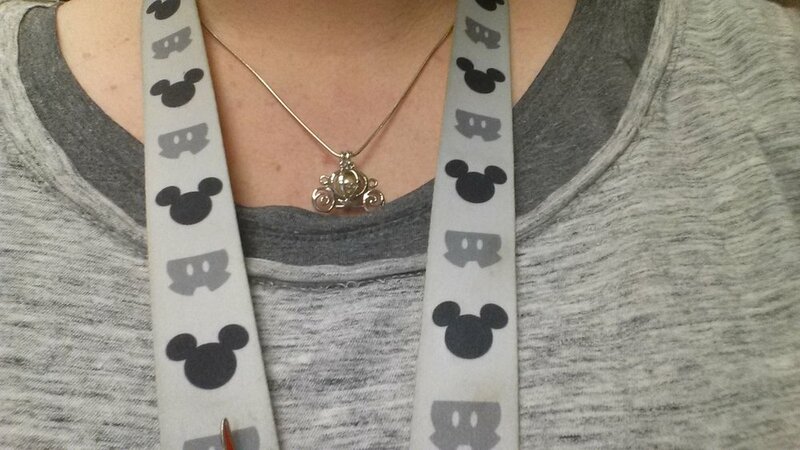 However, as with pretty much every day, I did purchase a couple of Hidden Mickey pin pouches. I also started my Pressed Penny collection! This was my first time using Dramamine on the rides, as well as being on anxiety medication. WHOA! I had so much fun on Big Thunder! I had my eyes open the whole time and was pointing out decorations I had never seen before. I had no anxiety during Splash Mountain either! In fact, Splash has now become one of my favorite rides. AHH! What happened to all the other weeks? They've been consume by WedCon planning, work, health issues and Mike Wazowski (see the cat blog). Disney can now become a focus once more, hopefully. I need to re-evaluate the content in my timeline and get rid of the non-essential planning that was put in primarily for fun. I'm also going to need to chop about a third of the movie list off, as we haven't been doing a good job of that lately. Things I have done: changed around some of our reservations, got the okay from my supervisor to take the time off, and sorted out who will cover my work while I'm gone. We still haven't nailed down who will take care of the the fur children, though. There are some refurbs I will need to remove from the plans (such as the train) and some new things I need to add (like the Muppets history show). We have only 20 weeks to go! How exciting! If you are planning your own Disney trip, please let me know in the comments below. Also, if you have any specific aspects of planning you'd like me to cover, I would love some suggestions for posts. My Liner pins arrived! I got two of exactly the same pin. One will serve as a backup, in case I lose the other. The phrase on the pin is very true- I definitely wait less thanks to Lines (and the Unofficial Guide). I had another splurge on items for my Disney trip this week. I had been wanting a pair of ears from Mila Mouse, but she only opens her website for orders occasionally, at very specific times. If you don't order quickly, you'll likely miss out on the ones you want. I was refreshing the page until it opened, and I still missed a pair that I wanted (Spaceship Earth). So I snagged Finding Dory and Haunted Mansion instead. It's time to take another look at my list of goals to see which ones I need to work into my touring plan. Also, I plan to add reminders and suggestions for goal completion in my touring plans. Record ride order on park map to help remember my trip details better- Still works! Eat a Disney Cupcake (that’s not the Grey Stuff, already tried that)- Keeping thisone! Do Pick-A-Pearl in the Japan Pavilion- Definitely in the plan! Get at least three character autographs- I'm hoping to get more than this, but this is good start. Buy a pair of earrings from a country in the world showcase (not Mexico, already have a pair)- Still doable. Ride Seven Dwarfs Mine Train- I'm so looking forward to this! I've seen enough ride videos, and read enough feedback that I'm not scared at all! See Festival of the Lion King- Can't wait for this either! Watch the Main Street Electrical Parade- I'm so sad, but I will need to remove this. No more MSEP! Take photos and record useful information for three excellent experiences with Cast Members, so I can give them a shout-out- Definitely doing this! Three photos of us (either Jimmy or I) per day- And this! Be a Fairy Godmailer for the Lines community- And probably this too. Okay, it looks like my goals are mostly still going to work. I just have to lose the Main Street Electrical Parade. I'm going to add reminders to my touring plans for some of these...For example, the photos and info of cast members I'd like to acknowledge..I'm going to add reminders in my touring plan under Notes (either in a break or on specific rides). Even if I don't use them at that time, they can keep me thinking of it. Other goals, such as Festival of the Lion King and Seven Dwarfs Mine Train I can incorporate easily into the touring plan without having to remember them. For the goal "Three photos of us per day", I can add in suggestions for places to take the photo (in front of the castle, with a character, with a particular attraction/decoration/scenery item, etc...) It's important to keep these goals in mind as I make my plans. All of the above will be completed before 5pm (unless its fireworks), and the remaining time will be spent on dinner (I'll just list suggestions), as well as additional rides that have a low-wait time or that we just want to do again. By having our plans end early, we can decide when we are ready to leave the park. If we have plenty of energy we can ride whatever rides we want, but if we are exhausted (or wet from rain/Splash Mountain), we can leave early without messing up our touring plans for subsequent days. Only 21 weeks until our Disney trip!!! My excitement has been rejuvenated by working on my touring plans. The black blog in the left corner is Fred! See the end of the post for a blooper. Jimmy & I are jumping out of our food "comfort zone" and we made an Advanced Dining Reservation for breakfast at the Garden Grill. Why is this out of our comfort zone? It's Character Dining- Character meals are also not our shtick. We are pretty introverted so our character interactions are usually few and awkward. Also, the presence of characters tends to make the meal more pricey- not something we are usually willing to pay for. It's Family Style- If you aren't familiar with this style, it is all-you-can-eat (like a buffet), but served to your table. Jimmy and I are light eaters...we tend to share meals, and we prefer a smaller meal with a snack a few hours later. On our last trip, we found the buffet meals to be our most expensive meals and they had the least value. Why are we doing it then? First in Line for Soarin'- Our reservation is pre-"rope drop" meaning we'll be in the park having breakfast before the park opens. The Garden Grill is in the land pavilion near Soarin' (a very popular ride) and we'll be able to jump in line for Soarin' before the hoards of people enter the park. With the addition of the new Frozen ride, there's going to be more long-line forming attractions than there are available Fastpasses, so it is important to get in line early. Highly Recommended- I got this idea from Shannon at WDW Prep, but I've heard several other people report the same experience since then. Shannon highly recommended the experience for the food, but also said that they were able to actually ride Soarin' before the park opened with no wait. Several other people have reported great food, a fabulous time, and getting to ride Soarin' early. It seems pretty enjoyable- The food has been described as very good, and the menu has options that both Jimmy & I will partake in. I've eaten at the Garden Grill, but not for well over a decade. The restaurant rotates (slowly, hardly noticeable) which gives a fun view of the Living with the Land ride. In addition, the "harvest" theme of the characters (adorable farmer Mickey) is very appealing. I really hope they are still serving the cinnamon buns with vanilla icing when we go...Jimmy will be all set! Me? I'll be good with the fruit and potato barrels (aka breakfast tater tots!). Have you eaten at the Garden Grill? Do you do breakfast on vacation? As I've mentioned before, one of my trip goals will not be accomplished because they decided to stop the Main Street Electrical Parade :::sniffle::: They couldn't have waited four more months?! Anyway, I was able to see some of the floats this week on a recent Disney Live Stream. I feel like some chunks of it were not shown, and they spent too much time interviewing people about the parade. Yes, I know it's good, Disney, so let me watch it. Also, if it is so good, why are you getting rid of it?! But, it was still fun to watch. All of our daily expenses are put on a Chase Disney Visa that I pay off on a weekly basis. This gives me Disney-specific cash back (as well as an adorable Finding Nemo credit card). It also gives bonuses like a special Character Meet & Greet line. To spend the rewards in Disney, you get a rechargeable rewards card. They suggest ordering this well in advance of your trip, in case there are any delays with its arrival. After you have a card, you can continue to add more rewards money on to it via the website. This week I ordered my card! I talk about the Touring Plans website and it's fellow Lines app all the time (here and on the old blog). Touring Plans meshes well with my style of Disney vacationing. Consequently, the people on their chat app (Lines) I love chatting with because they are like-minded folks. Lines is great for when you are in the parks (they answer *all* sorts of Disney questions very fast) and when you are not in the World and missing Disney (hear about other people's trips, and help answer their questions!). Folks on the Lines app call themselves Liners. They also like to look out for each other in the parks. A custom pin was designed for us and placed on Zazzle, so that we can identify each other in the parks. I ordered mine this week (thanks to a sale!). I'm debating on whether to add another table service to our plan. We had a great time at Liberty Tree Tavern on our last trip. We will be in the Magic Kingdom for three days. I adore MK, it's now my favorite park, but it has a pretty crappy food selection. I'm thinking of replacing one of the crappy quick service places with an LTT ressie if I can get one. Of course, the real reason I want to do this is because when they call you when your table is ready they announce where you are from. Last time, we were the Davidson's from the territory of Ohio. I'd really like to hear them call us now that we are from Virginia! This week I plan to continue reading the Unofficial Guide, mess around with Touring Plans more (I keep deleting and restarting as I change my mind), maybe clean some pennies, and work on my Disney binder. Fred did not want to let me take photos of Duffy and ShellieMay this morning! I needed to pet him! Whoa! It has been 10 weeks since I've posted my last countdown post. Life- new job, the process of selling out old house, a small first floor flood, and many other things- has kept me away. However, you may have noticed that the blog posts have been working their way back into my routine. As things settle down, I'm able to find more time to blog. And as Disney grows closer the more I want to talk about it. Blogging also helps organize my thoughts and planning strategy. Our 180 day mark has already passed, and I've already made our dining reservations. We have lunch table service reservations at Skipper's Canteen, Coral Reef, 50's Primetime Cafe, Yak & Yeti and Be Our Guest. We also have a pre-rope drop breakfast reservation for the Garden Grill! My copy of the 2014 Unofficial Guide has been missing since the movie. I decided to use that as an excuse to buy an updated one! I now have the 2017 guidebook, which I will read happily from cover-to-cover during my lunch breaks for the next couple weeks. I desperately need to post a news update because lots of changes have occurred recently at WDW. Many of which have impacted my touring plans. The Jungle Book and much of the nighttime entertainment at the Animal Kingdom will not be continuing this fall. This means AK will close at 6:00pm. I'm not sure what this means for our dinner prospects. Sum of All Thrills and another attraction are closing in Innoventions leaving a single display left in the pavilion in Epcot. The Main Street Electrical Parade has also been canceled. As you may recall, seeing the MSEP was one of my goals for this trip. Sadly, that will be another goal that I need to remove. I found a bunch of quarters in a box we hadn't gone through yet from the movie. I'm pretty sure these were from my yard sale last summer. Regardless of their origin, I now have a pile of quarters that I can use for my pressed penny mini M&M tubes! I've been updating our movie list on a regular basis. You can see it on the Disney page. The above is just a brief overview of the Disney planning that has been going on over the past 10 weeks. I'm getting deep into planning my touring plans now, so I will be going into more detail on those soon. My favorite part of Disney planning- creating touring plans! My previous plan (for our canceled trip) was to focus on specific areas inside of each park each day (for parks we were visiting more than once) in an effort to absorb the unique atmospheres of each land better. This is STILL going to be my strategy. However, I'm changing my "save the best for last" mindset. I had originally planned to do the parts of the parks I love the most on the later days in an effort to prolong the excitement. Recently, I've been having doubts about this plan...rides go down all the time...particularly older attractions, like Pirates. After discussing it with Jimmy, we decided we should do the opposite...start with our favorite lands first, and go backwards. This way if something we love is down the first day, we still have time to catch it. I had started working on our first day, in the Magic Kingdom, with Tomorrowland. Now, I'll be reworking the plan. The first thing we'll be doing on Day 1 after rope drop is heading to Adventureland! On this trip, we are planning on taking more time to appreciate the atmosphere, and also a lot of the smaller attractions we missed last time. We plan on riding Dumbo and Prince Charming's Carousel. Jimmy *may* have convinced to go on the tea cups (he also may regret that decision when he has to deal with the aftermath!). I also plan on doing more character meet n' greets. We plan on skipping some things we did last time that we didn't find hugely enjoyable. We found Space Mountain uncomfortable on our last trip, so we may give it a pass. Jimmy doesn't enjoy the 360 movies, so we'll be skipping O, Canada and Reflections of China. We also may skip the Stitch ride (it's mediocre), and possibly some shows at Hollywood Studios. We've been blowing through the list now that we have a library card! We've recently watched Ratatouille, Brave, The Muppet Movie and Pinocchio. This weekend we'll be checking on Finding Dory. I'll be posting an updated move list on the main Disney page. Are you planning a Disney trip? Tell me about it in the comments!